Antwerp High visit to the harbour house in Antwerp. 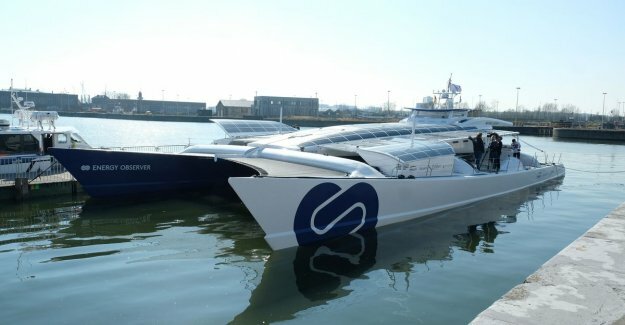 There is Friday, the Energy Observer, the first vessel in the world that his energy gets from self-generated hydrogen, solar and wind, moored. The unique ship is still up to 29 march in the Kattendijkdok. The Port of Antwerp organizes up to 24 march at the Zaha Hadidplein ‘Watt's Next’, an interactive exhibition in the sign of green energy in the maritime world. Schools, families and other interested parties can discover all the ways in which the havenwereld contributes to a transition to the circular economy. The showpiece of the event: the Energy Observer, a former racing boat that converted to a platform for new forms of energy. It is the first self-waterstofschip without emissions of greenhouse gases or fine particles. Hydrogen takes the ship from the sea water by means of electrolysis. In addition, it produces the ship also solar energy and wind energy. The founder-captain of the Energy Observer is Victorien Erussard, a French zeilkampioen from Saint-Malo. With his team he sailed on the waterstofschip all along fourteen countries in the Mediterranean Region, the first stage in a journey around the world. From Antwerp, the Energy Observer sail around Scandinavia and through Great Britain, for an ‘Oddysee’ along the North of Europe. “With our Odyssey, we want to meet people who innovate for the planet and show that economy and ecology go together to create solutions for tomorrow”, says Erussard.